Are You Looking For Beginner Guitar Lessons? Are the Lessons for a child, or a beginner teen or adult? 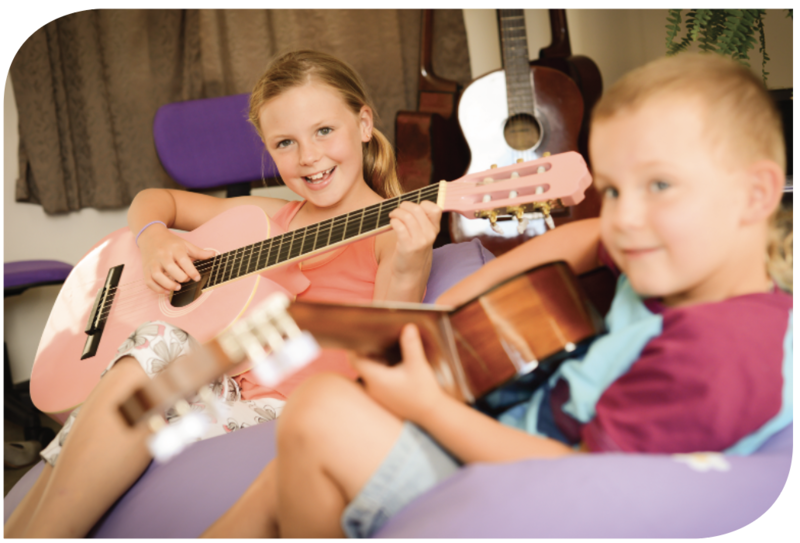 Gentle Guitar™ school specialises in private online music lessons for kids and youth. We teach guitar and musicianship to kids, teens and adult beginners. Lessons are once a week. Students meet with their teacher LIVE on Skype or FaceTime. 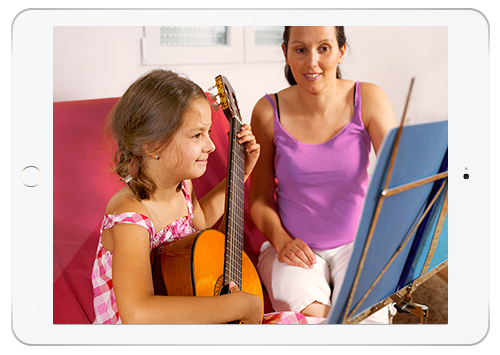 Our lessons work like any private music lessons. Only instead of having to travel to a lesson, you stay at home and save time and money. It’s effective and convenient! Why Learn With Gentle Guitar™? Why learn online instead of with a local teacher? Students learn live online for convenience or because they live too far to travel to local lessons. Thanks to technology and fast Internet, the experts come to YOU anywhere you live. Learning online with a live teacher is effective. More students choose this way of learning because it has the convenience of e-learning and the results of private tuition. There is not much difference between a local lesson and a Skype lesson. Learning online with a professional teacher is just as effective as learning with a local instructor. Book a free trial lesson and see for yourself why students are choosing private online lessons! The lessons are taught privately one-on-one, with special emphasis on developing good playing form and technique. We teach standard music notation because it is important for establishing a solid musical foundation. Our teachers are trained to work with young children and adult beginners. You can expect special attention to individual learning needs. The lessons are structured and professional, if you do the work you will see the results. The best part is the convenience. You can attend fun and professional weekly lessons without leaving home! 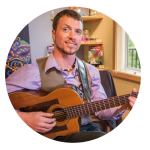 I first discovered Gentle Guitar through Pinterest, as I was researching options of adding guitar instruction to our homeschool curriculum. I appreciated that with Gentle Guitar we can have the lessons at home and at a time convenient for our family and homeschool routine. I love that Aaron's lesson is in the morning as part of our homeschool day. 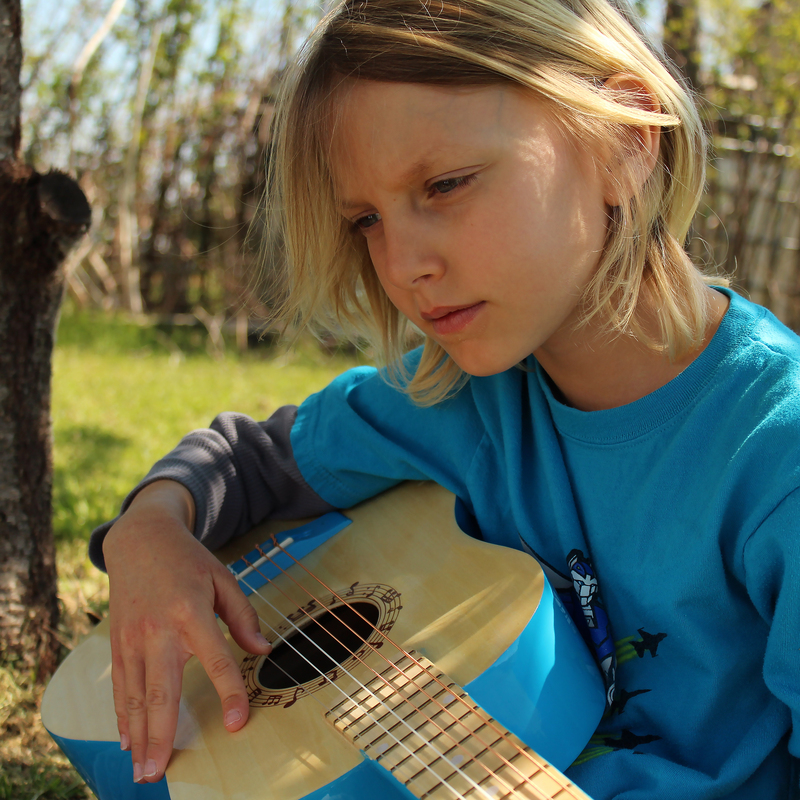 I value Gentle Guitar as a component of our overall homeschool curriculum, not just something "extra-curricular." 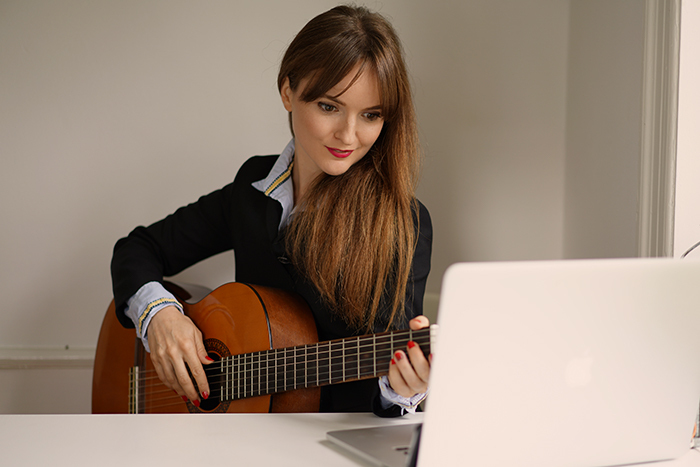 We decided to try the online lessons because the cost of Gentle Guitar over Skype was essentially the same as what a local instructor would charge, yet much more convenient! Guitar has been a wonderful outlet for Aaron's musical expression. 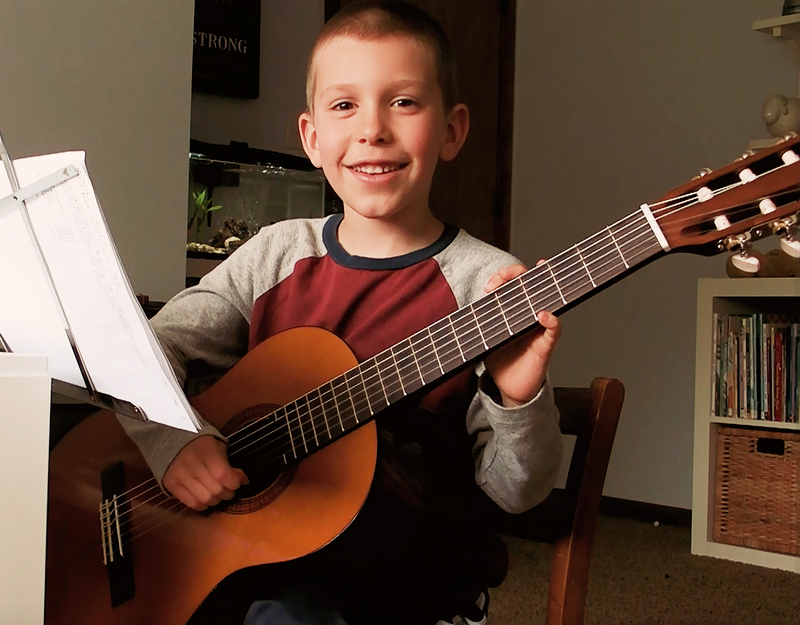 He's learning not just music theory and guitar skills, but he's growing in creativity, discipline, and perseverance. As a mom, I appreciate that Gentle Guitar lives up to the name and is truly gentle! The pace is individualized for the student, our teacher’s demeanor is very warm and encouraging. People are amazed when they find out Aaron attends lessons through Skype, but it's such a wonderful way for him to learn. And because I sit with Aaron through the lesson, I'm actually learning right along with him! If a family intends to pursue guitar instruction, there's no reason not to give Gentle Guitar a try. Gentle Guitar™ lessons start at just $25 (USD) per week and are invoiced monthly via PayPal. Quality one-on-one tuition is always more costly than video courses or group instruction. With one-on-one lessons the teacher’s attention is 100% on the student. Mistakes get fixed fast and engagement is high! The student makes 10 times faster progress and learns proper playing technique. One-on-one lessons is the easiest and best way to learn guitar for children and adult beginners. Not all lessons are taught the same. Many teachers are excellent musicians but don’t have the training and experience to teach kids and beginners. Our teachers have the right training and the best teaching tools on the market. 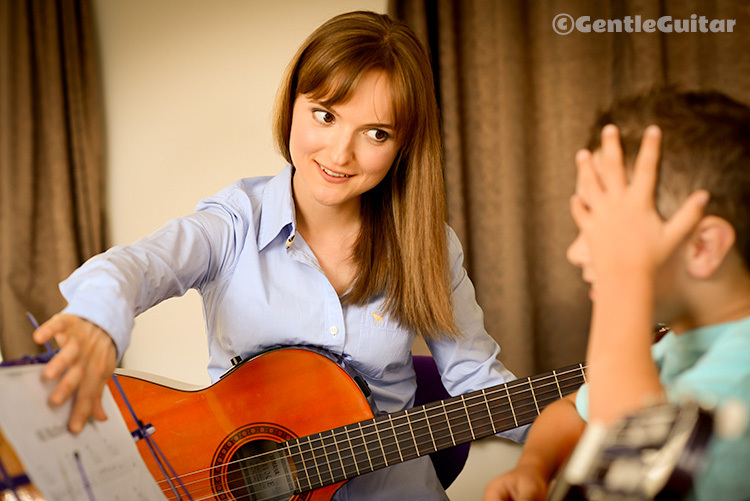 Gentle Guitar™ specialises in how kids and beginners learn guitar. We apply the latest science and research to make learning easy and fun for beginners of all ages. We publish our method and teacher-training resources because our passion is helping beginners learn to play the guitar CORRECTLY. Other guitar teachers from all over the world praise our teaching tools and experience. Each age group has different learning challenges and advantages. Our program is expert tailored to each specific age group based on over 10,000+ lessons taught all over the world. Your teacher then further fine-tunes your (or your child’s) study according to individual music taste and learning ability. We ensure that you have 90% success. The other 10% depends on your commitment to show up to lessons and complete the easy weekly homework assignments. Learning ANY musical instrument is hard work, so how can hard work be fun? Years of working with children has taught us that EASY equals FUN. We make the tuition easy, yet challenge each student individually at their level. When students feel successful and accomplished at what they do, it boosts their confidence. As their confidence grows the learning process becomes exciting. What else can I accomplish? What else can I do? At Gentle Guitar™ fun means progress and musical development. We teach students how to build a positive work ethic and efficient practice habits. 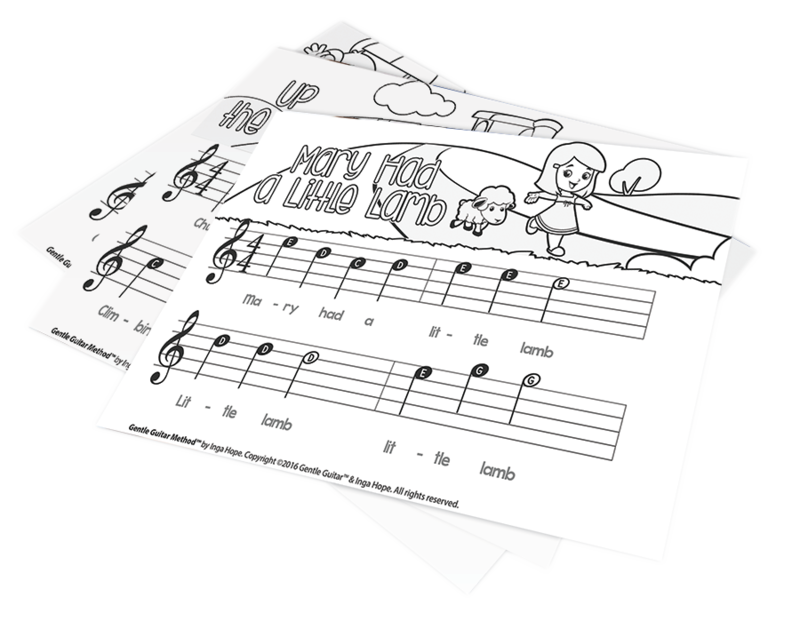 Over time even young kids become fluent at sight reading standard music notation and keeping flawless rhythm. 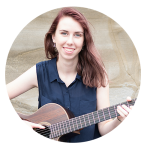 We first found out about Gentle Guitar through The Homeschool Sisters Podcast and have been taking lessons since March 2017. Our son loved it so much that after the free trial we decided to continue the lessons. We were skeptical at first, but after the first couple of lessons on Skype we quickly realized that this was an amazing way for our son to learn how to play guitar. Our son is a perfectionist of the highest order. 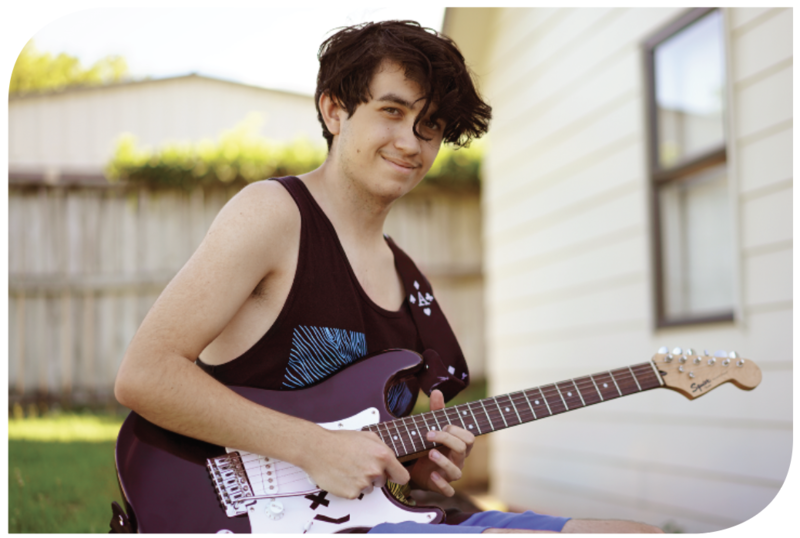 We have found that learning to play the guitar has offered him a way to learn how to deal with his perfectionism. Most people cannot simply sit down and play an instrument. It takes practice. This is something he is not used to having to do and it's been great for him! Inga and John have been fantastic at engaging our son with his guitar lessons while also providing him with patience and encouragement. I love how the instructors really get to know the child and then incorporate the interests of the child into the lessons making them more engaging. This is an amazing program especially for sensitive, intense and perfectionist type kiddos who may not do well in a regular lesson setting. Don't hesitate! Give it a try and see for yourself! Homeschool families from all over the world. Expat families from all over the world. Families living rural lifestyles who don’t have access to local music lessons. Busy families who need to optimize time. Families who place high value on professional music education for their kids. Adult beginners who want to learn acoustic guitar and prioritize good foundations and technique. Adult beginners who feel lessons with other teachers are fast-paced and disorganized. Adult beginners who want convenience and don’t want to travel to and from lessons. This is, Maddie, one of our teachers. 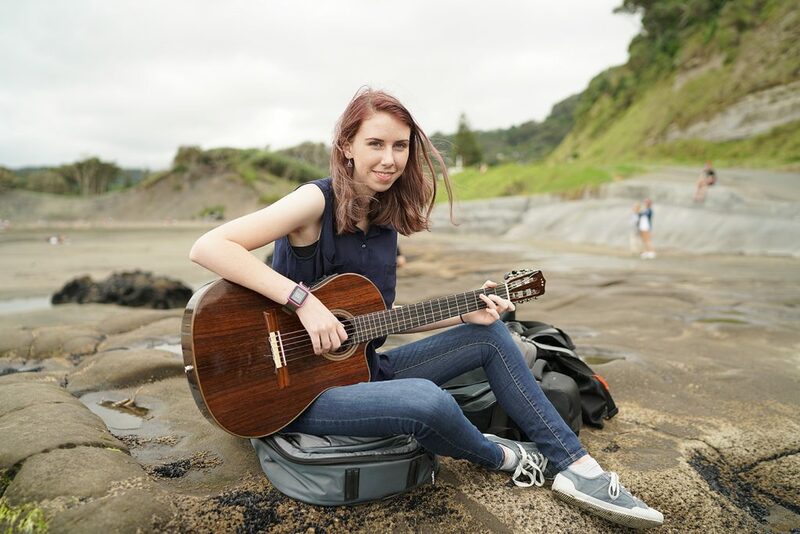 Maddie lives in New Zealand and teaches Skype guitar lessons to kids, teens and adults. Did you know that Maddie was once a Gentle Guitar™ student? She started with our program at age 13. 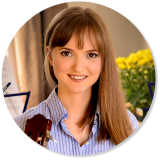 Now she studies classical guitar professionally and remains in the Gentle Guitar™ family as our youngest teacher. 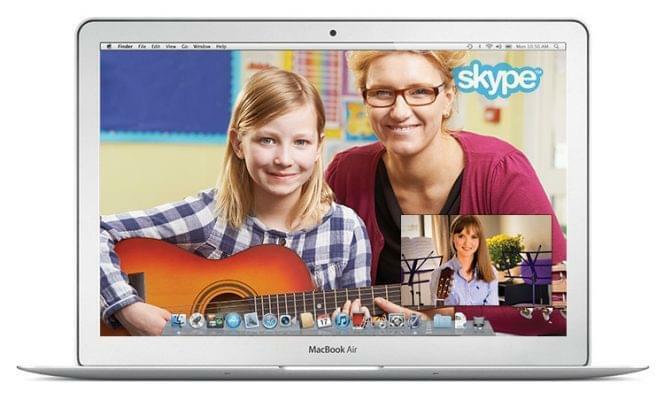 Book a free lesson and let’s try a music lesson over Skype!